The Athens Dining Set is heavily cushioned for the ultimate in comfort. Are you and your loved ones wont to sit outside on your patio, watching the afternoon turn to evening and then nighttime? The Athens Dining by Meadowcraft offers the heavily cushioned seating style that is often reserved only for deep seating collections. The seats may be fluffy, but they are made rough and tough to resist damage from inclement weather. The frames are heavy duty wrought iron, which is known to be virtually indestructible, come heavy winds or torrential downpours. Meadowcraft treats the wrought iron frames with the greatest care and expertise. 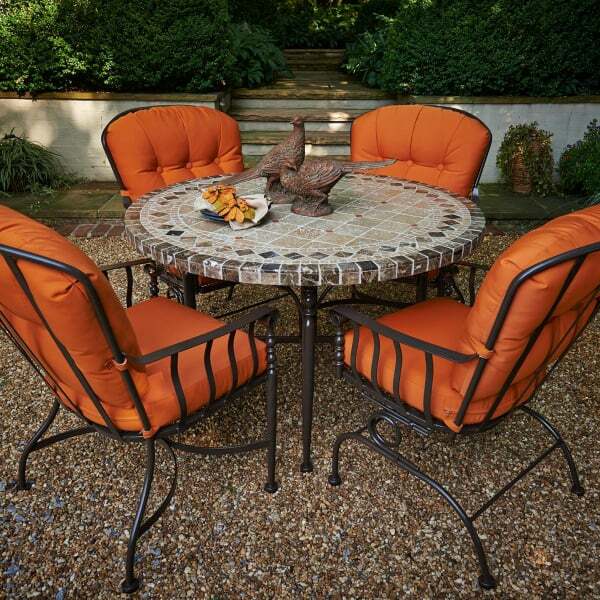 They are the largest American manufacturer of wrought iron patio furniture. The cushions are plush for comfort and wrapped completely in tough all-weather fabrics. Mix and match the stationary Dining Chair and Action Dining Chairs to meet your seating needs, then tie it all together with an attractive Travertine outdoor tabletop.